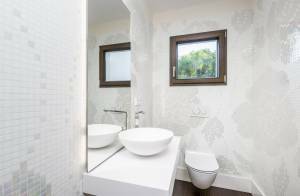 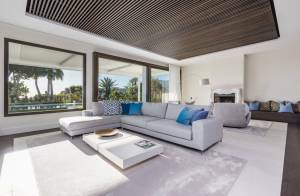 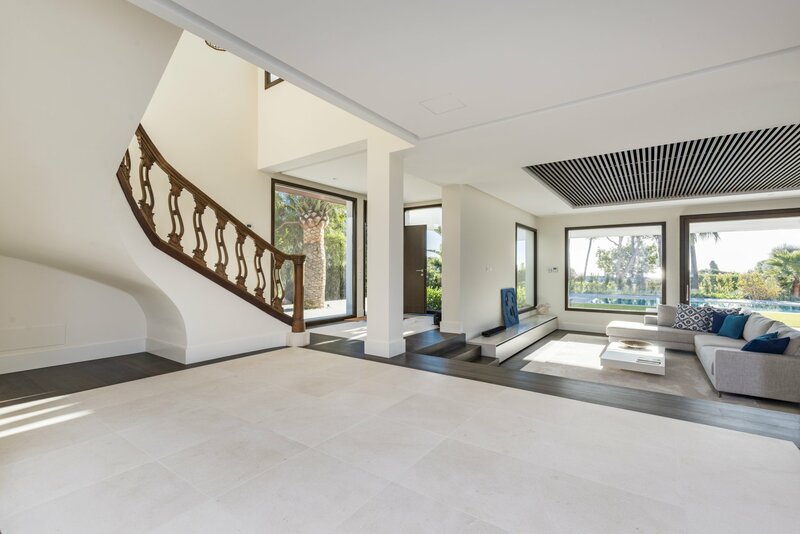 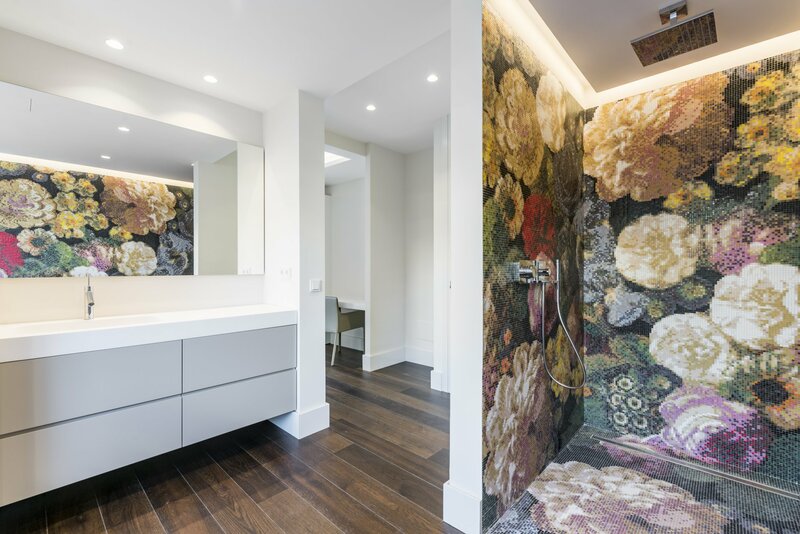 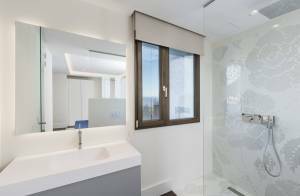 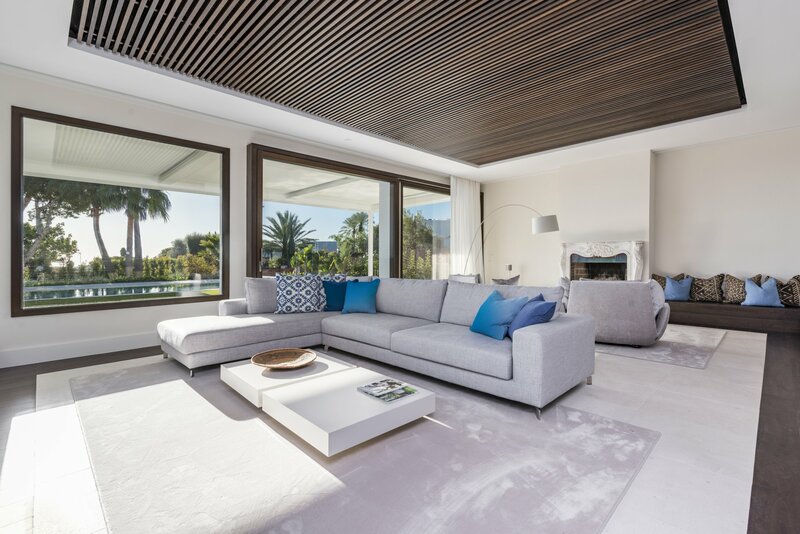 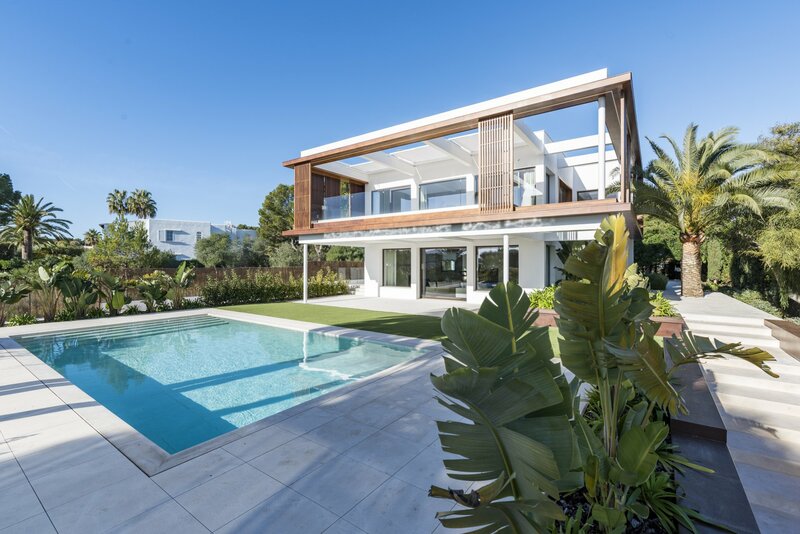 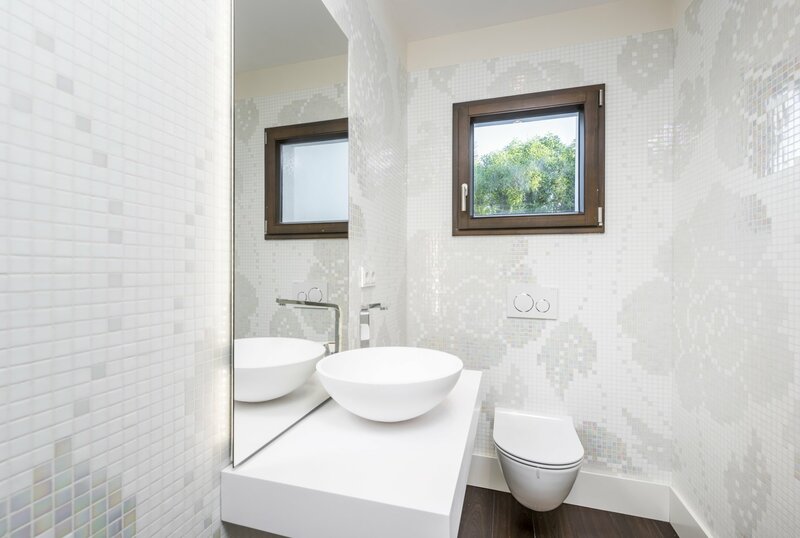 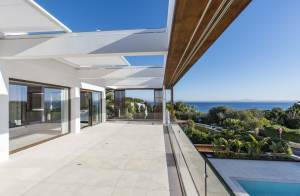 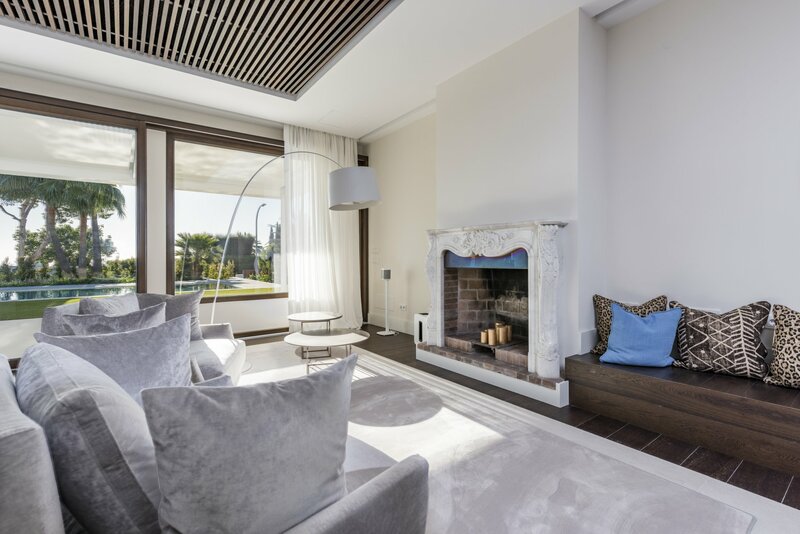 This completely renovated villa, in a modern architectural style with many wooden elements, is located in Sol de Mallorca, close to golf courses, the ports of Puerto Portals and Port Adriano, as well to the city of Palma. 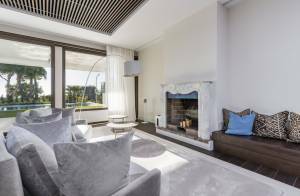 The villa has a large, bright and open living room with fireplace, for pleasant hours in front of the open fire in winter. From the living room you have access to the terrace with beautiful sea views and the large pool. 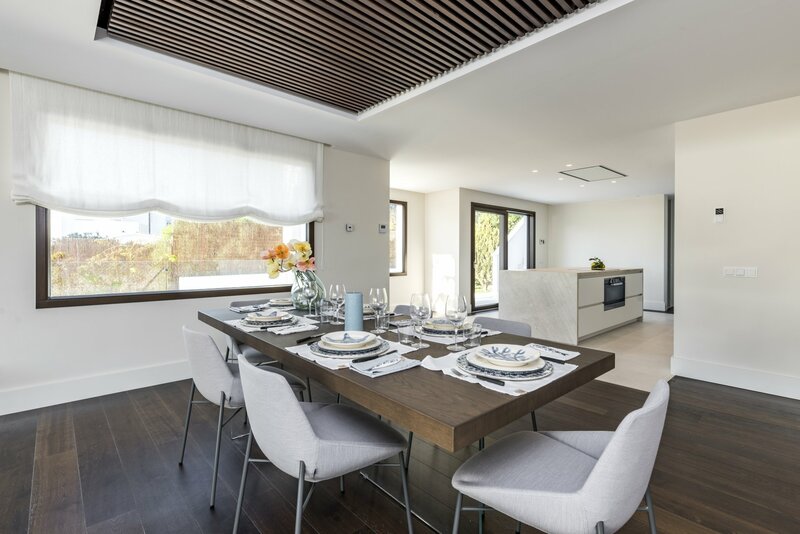 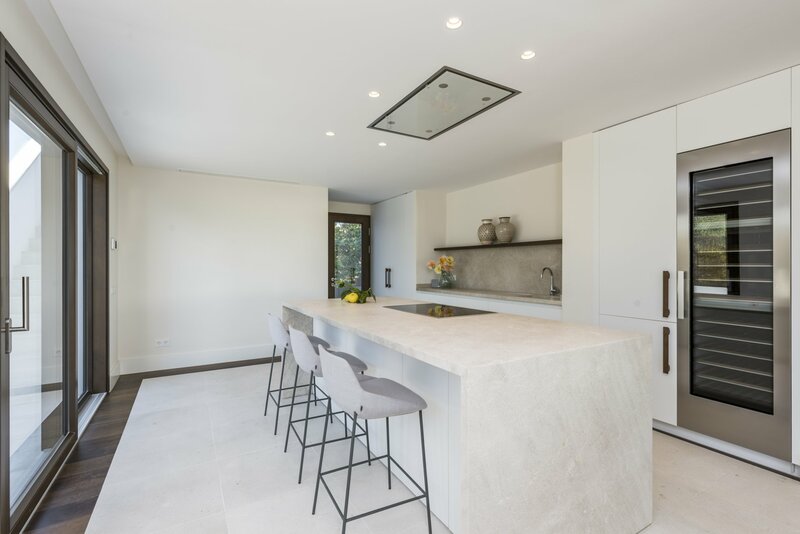 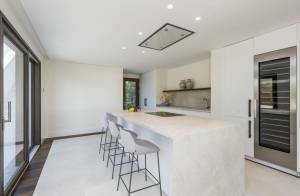 The dining area leads to the modern open kitchen, with adjoining utility room and storage space, as well as access to the terrace at the rear of the villa. 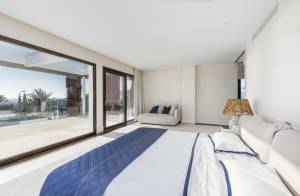 In addition, there is a guest bedroom with bathroom en-suite and a guest toilet on this level. 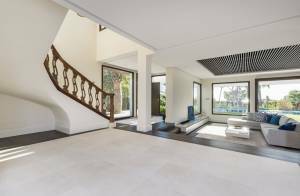 A majestic staircase with a valuable wooden railing leads to the upper floor where there are 2 further double bedrooms with en-suite bathroom, as well as the huge master bedroom, which has a dressing room and a beautiful bathroom with mosaic walls. It also has access to the large sun terrace with fantastic, unobstructed sea view. 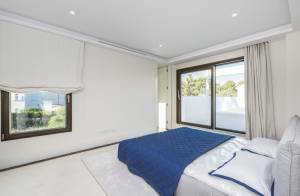 The villa has underground parking for at least 3 cars, as well as a room that could possibly be used from the gym or as a further bedroom, as there is a full bathroom with shower. 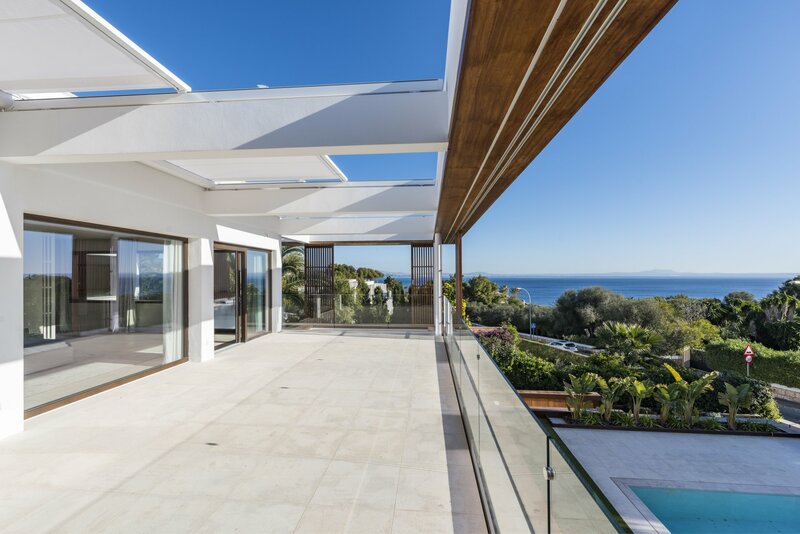 Parquet floor, underfloor heating, solar system, air conditioning w / c are just a few features of this beautiful villa. 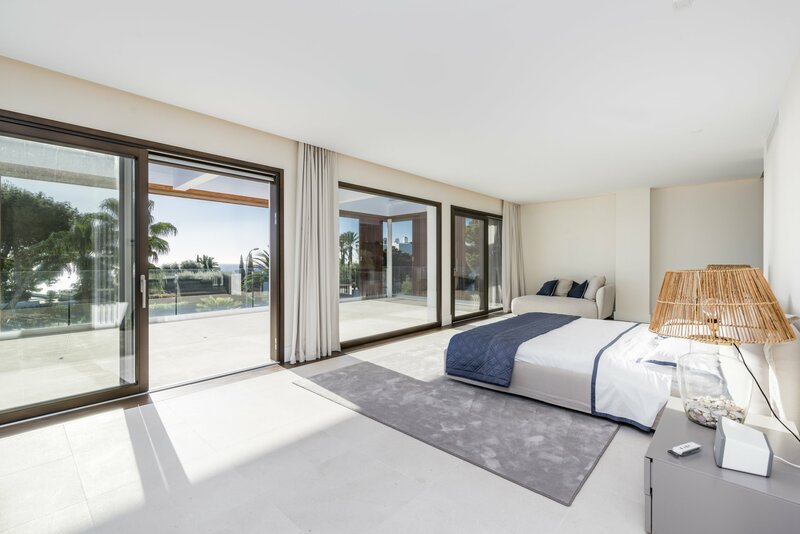 The residential area Sol de Mallorca offers you pure relaxation. 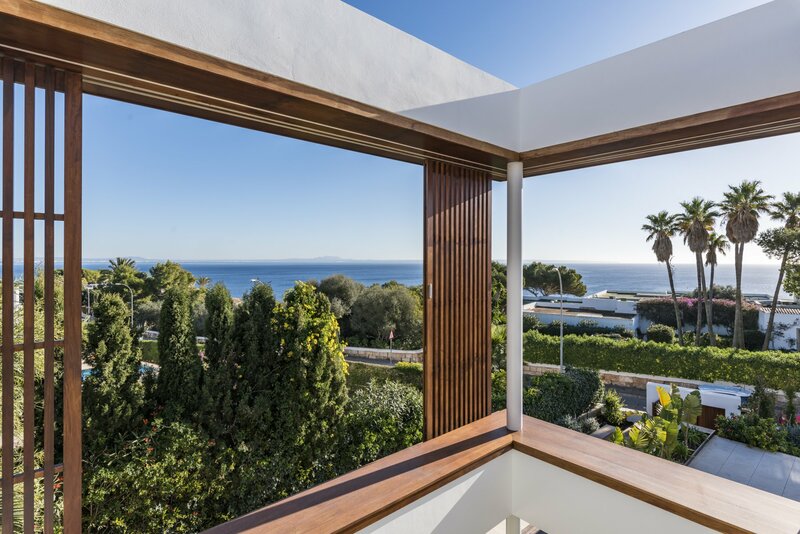 With its less than 25 streets it is one of the smallest and yet most exclusive villages in the Southwest of Majorca. 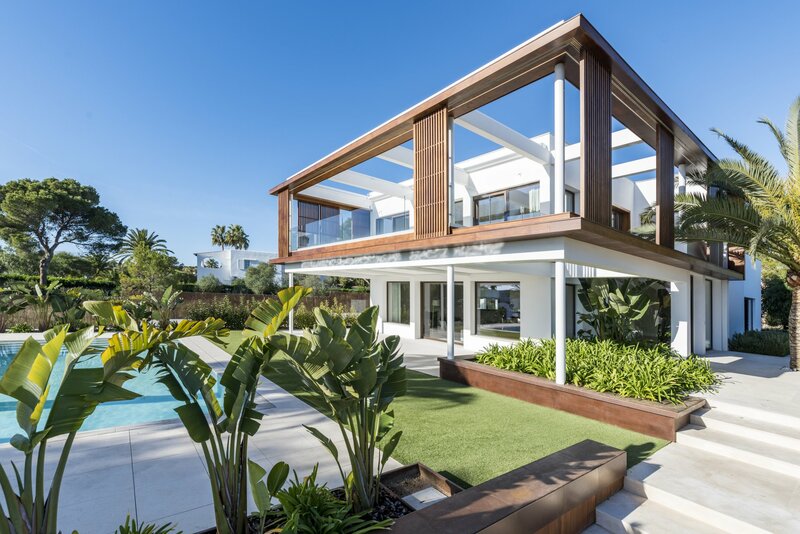 Golf lovers are in the right place here. The T-Golf and Country Club is located just 5 km away and is open all year round. 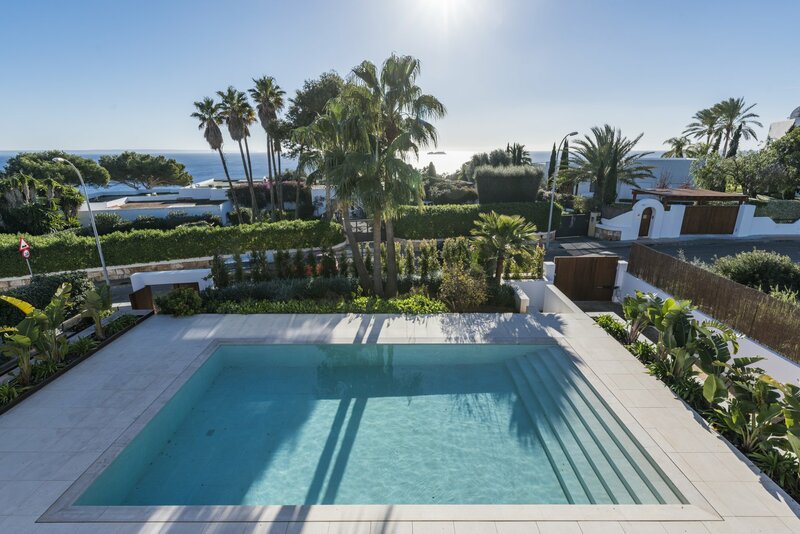 Furthermore, the so-called „Three Finger Bay “– Portals Vells invites you to enjoy some time at the beach.